Start your day off by sampling one of the city’s best breakfast eateries, the Food Network Magazine-featured Egg Plantation, serving over 101 different types of omelets and other breakfast favorites, including employee top picks, and delightful coffee specialties with freshly baked biscotti. For big city flavor with home town service, check out Thelma’s Morning Café. The Santa Clarita restaurant is owned by a former Wolfgang Puck pastry chef and the menu definitely reflects it. Make sure to try the crepes! Other favorite Santa Clarita restaurants for breakfast include Tea Elle Garden Cafe, Eggs N Things or Waystation, which provide patrons with some sweet & savory options as well. Once you’ve had your fill of breakfast treats, be sure to visit William S. Hart Park and the William S. Hart Museum. A member of the Natural History Museum of Los Angeles County, the William S. Hart Park is the former home and ranch of William S. Hart, a silent film cowboy star and director. 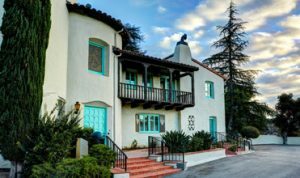 The Spanish colonial Revival style mansion contains original furnishings, an impressive collection of western art, and mementos of early Hollywood and Native American artifacts. The Hart Museum sits atop a hill within a large wooded park area. While exploring the park, be sure to check out and enjoy the collection of farm animals, a herd of American bison that meander along the hillside, a vast picnic area, a series of hiking trails, and a charming Western-themed Gift Store. If you can’t get enough of the naturally preserved beauty of the park in Old Town Newhall, stop by specialty stores like Whole Foods, Sprouts or Trader Joes and pack a picnic! Next up is Placerita Canyon and the Placerita Nature Center. A network of self-guided natural hiking trails radiates out into the park from the Center, with longer hikes leading to a seasonal waterfall and to the top of the Santa Clarita Divide. Among the notable points of interest in Placerita Canyon is the Oak of the Golden Dream, the site of California’s first gold discovery in 1842. Every Saturday the Nature Center offers a Nature Walk at 11:00 a.m. and a native live animal presentation at 1:00 p.m. There is no charge for these programs and they are fun for all ages. For a more intense hiking experience, head to Towsley Canyon for some of the most breathtaking views of the valley. Experience nature and wildlife firsthand as your explore Santa Clarita’s mountainous regions. For more information on exploring Santa Clarita’s open space, visit HikeSantaClarita.com to learn more about the eight different areas of open space available for exploring the hills of Santa Clarita, including Towsley Canyon. Also available from VisitSantaClarita.com is a trail map that includes more than 80 miles of picturesque trails and paseos designed for commuting and recreational use, including walking, riding, jogging, and skating. In addition, check out this mountain biking map fromBikeSantaClarita.com. The regional river trail serves as the backbone of the Santa Clarita trail system. Together with connecting trails, visitors can access parks, entertainment and shopping venues. After your day on the trail, embrace a little down time back at your hotel with a little poolside lounging. Then, after you’ve gotten strength up, head out for some laughs at JR’s Comedy Club! The club is located inside Mimi’s Cafe, so make it dinner and a show! With a good night of sleep behind you, you’ll be up and ready to embrace nature once more. Fortunately, Santa Clarita is an outdoor oasis! An entire day of fun awaits at Castaic Lake! The lower lake, known as the lagoon, is open to all sorts of recreational activities such as kayaking, float tubing, non-powered boat fishing and general swimming. A campground is even available for RVs and tents in Castaic Lake. The upper lake, the reservoir, is open to power boating, fishing and water sports. If you’d like to take a break from the water, you can enjoy a picnic at the Lake’s ample park areas or explore the quality trails on a bike, a horse, or by foot. At dinnertime, head back towards the city center and treat yourself to a Santa Clarita hot spot, such as Lazy Dog or Wokcano. If you are searching for something a bit unique, you’re in luck! Santa Clarita is home to a variety of dining hot spots to choose from, whether you’re looking for a nationa lly-recognized brand or a Santa Clarita signature. Our dining options offer a variety of restaurants and specialty eateries for every palate. After dinner, head down for a great evening out at Wine 661. With some 20 wines available by the glass regularly and another 200 available by the bottle, even wine connoisseurs will find something worth uncorking! That, coupled with weekly specials that include everything from All Day Happy Hour to $10 Tuesdays, means your night out will be one worth remembering.